Hello Friends, how are always healthy and happy yes, welcome to come back in this elcircuit,okay friends of this time I will share to you a layout is an additional circuit for the purposes of the project of a circuit of audio that you make, Yea this time I share a PCB The circuit Giga Bass that's for sure you know if you frequent modifications in audio project. 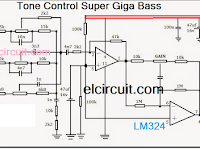 Giga Bass circuit is a circuit auxiliary wherein the circuit which you create by relying on a tone control or with additional equalizer but the tone and beat it is still not kicking, This circuit functions as a circuit of galaksi 4558 tone boost. 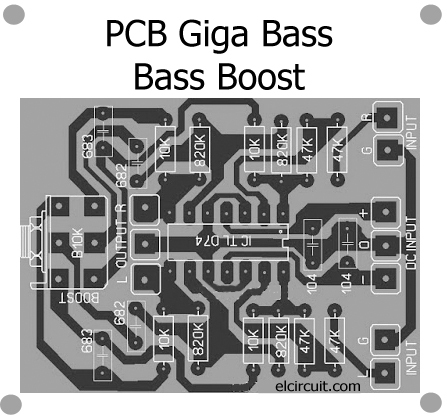 that might already know ahead in comparison with this circuit giga bass.